Chemical Peels – Worth It? This isn’t a horror story of bad experience with a chemical peel but rather shedding light on the positives of these types of treatments and how they are beneficial. Believe it or not, chemical peels are becoming way more popular in the last few years. The reason why is because of more knowledge and understanding about what they really are versus what some people perceive them to be. Let’s answer the age old question – What is a Chemical Peel? A Chemical Peel is a treatment used to improve skin texture and tone (to name a few benefits) An acid (solution) is applied to the skin to lower the pH, which loosens the connections between dead skin cells, inducing exfoliation and stimulating new cell growth. Sounds amazing right? It really is!! There are different types of peels – acid and herbal. The biggest misconception about acid peels is that they are bad for the skin. This is simply not true. When the proper levels of a type of acid are used, and used correctly the results are amazing. Where it gets tricky is if the acid peels used are not FDA and Health Canada approved. Controlled acid peels are completely safe and provide amazing results for the skin. Did you know – Chemical peels have been used dating back to Ancient Egypt. Cleopatra used sour milk to improve the appearance of her skin. Lactic Acid is the active ingredient in sour milk. 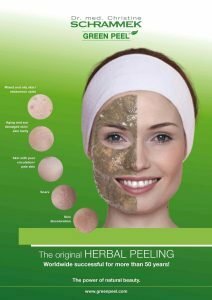 Herbal peels are just peels that don’t have any acids in them. They are plant based and work differently then acid peels but still provide the same great results for skin. The biggest difference from herbal to acid peels is that acid peels work from the outside going in and herbal peels work from the inside going out. Acid Peels are things to be cautious about. only certified skin care specialists can use FDA and Health Canada Approved Acid Peels that are safe. When you hear about horror stories about Acid Peels it’s usually because the individual picked something up over the counter or ordered something online. Watching YouTube videos is not a fair assessment of how Acid Peels work because of the misuse of the acids/products. It’s not general knowledge, but most acids are derived from natural products. Each acid is specifically designed to treat and maintain various skin conditions. For example, Lactic Acid has its roots from milk is best suited for individuals who are looking to brighten up their skin; it also a good option for those clients who are more on the sensitive side as this acid is much gentler than its counterparts. Let’s break down what we have at Laserlicious with Peels. The Green Peel treatment is a medically-developed biologically-based method with exclusively natural plant based ingredients. This purely biologically-based peeling treatment has a plant-based compound of active ingredients in which the individual components work together to achieve the desired treatment objectives. Did You Know – Laserlicious is one of the few MedSpas in the GTA that offers the Green Peel; we also have over 10 years experience with this treatment and benefits. It is a proprietary service, one that we are very proud to have and provide for our clients. What are the benefits of the Green Peel? Loosening of Upper Layers of the Skin – This stimulates the growth zone of the skin to produce new cells. The result: increased regeneration of the epidermis. Increased Production of the Body’s Collagen – This leads to a quality improvement of the skin in terms of complexion and structure, firming of the skin, a reduction of wrinkle depth and a smoothing or even elimination of scars. Comedolytic Effect – In the case of acne and impure skin any clogging of the sebaceous gland ducts is reduced, thus diminishing or preventing the formation of blemishes and/or blackheads. The increased circulation promotes the healing and elimination of papule and pustules. Did you know – There are three levels of the Green Peel. Green Peel Fresh-Up (light) Green Peel Energy (medium) Green Peel Classic (deep) Each one is designed to suit different needs and accomplish different results. Now that you know more about our Green Peel, let’s talk about our other treatments. The Glow Peel combines 7% Lactic Acid, 7% Salicylic Acid and 7% Resorcinol, creating a multipurpose resurfacing solution which is effective in minimizing the appearance of fine lines, wrinkles and hyperpigmentation issues like age spots, discolouration and uneven skin tone. Do not be fooled by the small percentages, this highly effective mixture is more effective than some acid peels that have percentages of 30% and more. The reason behind it is that the pH levels in this peel are lower thus making the acids that much stronger. This unique formula exfoliates dead skin cells and stimulates cell renewal. Just by reading the above, it’s easy to see why this is a popular treatment among our clients. Like the Green Peel, the Glow Peel can be adjusted in strength to target specific skin concerns like acne and hyperpigmentation. The biggest difference between the Green Peel and the Glow Peel is that the Green Peel works from inside out and the Glow Peel works on the outside going in. Both effective treatments, both do amazing things for the skin. Our New Treatment is the Brightening & Anti-Aging Treatment! This unique combination is 20% Lactic Acid and 10% Glycolic Acid – these are perfect ingredients to decrease the visible signs of aging and hyperpigmentation. This treatment is aggressive in its exfoliation of dead skin cells and boosting cell turnover which then improves skin texture and tone. Did you know – Glycolic Acid derives from sugar cane, it’s true! The power combination of Glycolic and Lactic Acid leaves the skin fresh and clean and glowing. With the brightening from the Lactic Acid and the plumping effect from the Glycolic Acid this is a sure winner for all clients who are in need of a little TLC. Wait! There Are Two More!! That’s right, we have two more treatments we need to talk about. We have a brightening treatment that uses 30% Lactic Acid which gives the skin a natural looking glow. Clients who are sensitive and/or reactive skin tend to like this treatment most due to its gentleness and clean skin feeling results. We also have a treatment that is geared towards acnaic and/or acne prone skin which is the Acne Treatment that uses 20% Salilcylic Acid. Salilicyic Acid is the most common ingredient in acne treatments because it reduces redness caused by acne and kills bacteria that causes breakouts which reveals healthy skin lying underneath. Now you know more about Chemical Peel and the benefits they have for the skin. Chemical Peels are meant to exfoliate, brighten and tighten the skin; when used properly Peels can change the way the skin looks. There are no excuses now… You have to call Laserlicious to book your free consultation and skin analysis to see which Peel treatment is right for you!